In December of 1976, a Universal Studios camera crew arrived at the Nu-Pike Amusement Park in Long Beach, California, to film an episode of the television action show, the Six Million Dollar Man. In preparing the set in a corner of the fun house, a worker moved the "hanging man," causing one of this prop's arms to come off. Inside it was human bone. This was no mere prop; this was a dead guy! 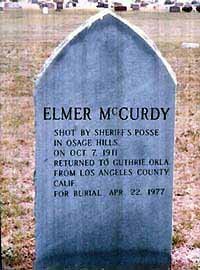 Elmer McCurdy was not a famous outlaw. In fact his last train robbery netted him $46.00 and two jugs of whiskey. He announced to the posse in pursuit of him that he would not be taken alive and the posse obliged by killing him in a shoot-out. He gained notoriety for what happened after his death. In 1977, Oklahoma train robber and safecracker Elmer McCurdy was buried next to Bill Doolin in Guthrie, Oklahoma, after spending 66 years on the road as "a real dead outlaw" in sideshow and carnival attractions. 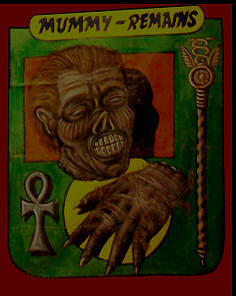 McCurdy's body became a sideshow attraction right after his embalming. It is claimed that the local undertaker thought he had done such a wonderful job at restoring McCurdy that he let the towns folk see him for a nickel a piece. The nickels were dropped into the corpse's open mouth and later collected by the undertaker. No one ever showed up to claim McCurdy's body, so, legend has it that the undertaker kept him around to collect nickels for a few years after the embalming. Carnival promoters wanted to buy the stiff, but the undertaker turned them down. He didn't want to lose his most steady form of income. Five years later in 1915 two men showed up, claiming that McCurdy was their long lost brother and promised to give him a proper funeral. They took McCurdy away, supposedly to give him a decent burial in the family plot. In actuality, the long lost McCurdy "brothers" were carnival promoters. A month later he turned up in a carnival in West Texas. It was a scam to get the body that they had wanted for years. They exhibited McCurdy throughout Texas under the same title that the undertaker had given him -- "The Bandit Who Wouldn't Give Up." It seems that McCurdy's body popped up everywhere after that, in places such as an amusement park near Mount Rushmore, lying in an open casket in a Los Angeles wax museum, and in a few low-budget films. He continued to tour with carnivals until 1976 when he was finally discovered by mistake hanging in a California fun house as a wax dummy. The Six Million Dollar Man crew discovered this prop to be a corpse, McCurdy had been hanging in a Long Beach fun house for four years. 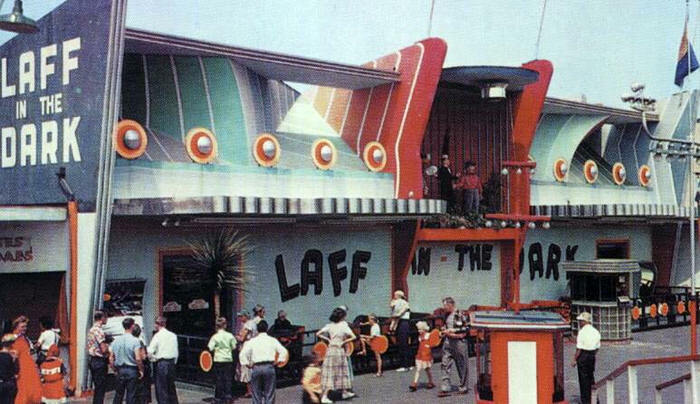 In 1976, Laff in the Dark, a dark attraction located in Long Beach California, leased their location to Universal Studios to film an episode of the Six Million Dollar Man. While making adjustments to the set, one of the workers attempted to move a "prop," a mummified man that had been painted several times with phosphorous paint and was suspended from the ceiling by a noose around it's neck. Grabbing the hanging figure by the arm in an attempt to loosen the noose, the prop man was startled when the lower portion of the man's arm hit the floor! Long Beach police were called in, and the following is an excerpt from the police report filed December 8, 1976. The Laff in the Dark located at 210-A-A-A West Pike Avenue was entered, and their attention was drawn to the human-like display, which was hanging from a rope. Criminologist E. Williams and filing officer examined the display, and noted beneath the outer covering there appeared to be bone-type structure having bone like joints. There was also noted to be a small trace of hair on the back of a leg. The display remarkably resembled a human cadaver in size and proportion. The body was transported to the LA Medical Examiner's office, where an autopsy was performed, confirming the remains were human, that the cause of death was from a bullet wound and that body had been embalmed using arsenic, which had mummified the body. 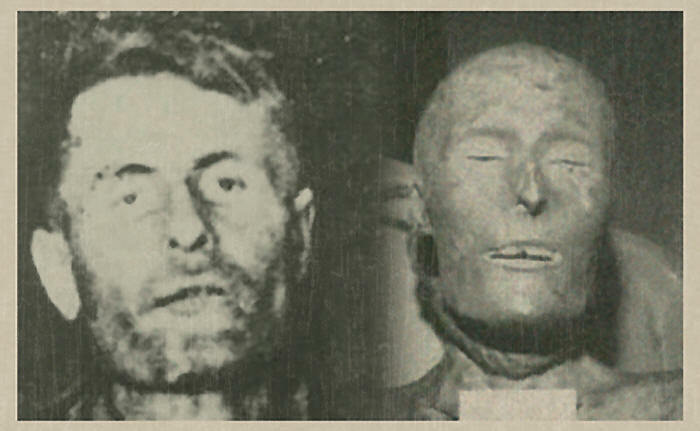 The use of arsenic led the examiner to believe "John Doe" had died between 1905 and the late 1930's. On December 9th, the coroner's office released a statement, and the Sonney family quickly identified the body as Elmer McCurdy. Elmer McCurdy had been born to a life of shame in 1880 to Sadie McCurdy, an unmarried 17 year old who still lived with her parents. While his father was never confirmed, it was speculated that it may have been a cousin who was 7 years older than the young Sadie and who had lived with the family for a short while. In an attempt to spare the family the embarrassment of his birth, Sadie's brother and his wife Helen adopted the infant. His adopted parents raised Elmer along with his younger brother (cousin) for ten years, until his "father" died. At this time, "Aunt Sadie" moved into the house to help the widowed Helen take care of the two boys. After a brief period of time, Helen asked Sadie to assume responsibility for Elmer, and Sadie agreed. The two women sat the young boy down to explain to him the circumstances of his birth. Taking the news well at first, perhaps attributed to youthful naivety, until about the time he turned fifteen, when a growing feeling of betrayal by his mother prompted him to run away. Drinking and rebellious, the young man worked at various jobs until joining the service in 1910 where he served his time and was honorably discharged. Finding a job proved difficult and McCurdy took to heavy drinking and criminal pursuits. Teamed with three other men, Elmer set out to rob the "Iron Mountain" train. The would be robbers boarded the train successfully, however, this being Elmer's first attempt at cracking a safe, he misjudged the amount of nitro needed and according to reports by the Pacific Express Company, the door blew completely off of the safe, melted the nearly $4,000 in silver coins and the explosion tore a gaping hole into the side of the express car. Using a crowbar, McCurdy attempted to chip the silver from the walls and floor it had adhered to but with little success. When the train pulled into the station, it was figured the robbers made off with $450. McCurdy parted ways with his partners and soon found new ones, first pulling a poorly planned bank heist and then returning back to the trains. Holding up the M.K.&T. passenger train number 23, the crew made off with one of the smallest hauls in history, and for Elmer, this would be his last. Their hiding area soon surrounded by officers, they waited until dawn before the first shots were fired, and reportedly, the very first shot by McCurdy. Gunfire exchanged for an hour, at the end of which, McCurdy was found dead. That evening, Elmer McCurdy's body was brought into town on the back of a wagon, where it was placed in a wicker basket, photographed, and turned over to the undertaker. The body sat in a back room for six months unclaimed. The arsenic used in the embalming fluid had preserved the body perfectly and the mortician had discovered when the body was removed from the slab, it was able to stand. Dressing the "embalmed bandit" in the attire from his last gunfight, they positioned him in the corner of the mortuary, gun placed in hand, where he stood on exhibit for 5 years. In 1916 two men visited the Sheriff and County Attorney of the town, one claiming to be the brother of the deceased, and they wanted to bring the body home to their mother who was worried sick. The mortuary was instructed to turn the body over to the men. The loving family members turned out to be James & Charles Patterson, James was owner and manager of a traveling carnival show. Elmer would be a star. The mummified burglar traveled with the show from 1916 until 1922 when the exhibit was sold to Louis Sonney, who had a wax museum sideshow called "The Museum of Crime." Elmer was a part of the show until 1971 when Sonney sold his show to Spoony Singh, owner of the Hollywood Wax Museum. When the sideshow did not work out once again, Elmer was sold. This time to Ed Liersch. Once again part of a sideshow, the criminal was no longer MIB (for those who do not speak geek, that is "Mint in Box"). His wicker casket had long fallen apart, and he now rested in a cardboard box, and was displayed as the "1,000 Year Old Man." Five years later, he would be reduced further, removed from the cardboard box, slapped with paint, and would be found hanging in "Laff in the Dark." 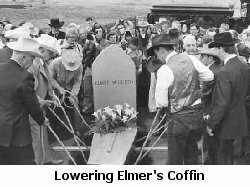 In April 1977, the much-traveled Elmer McCurdy was laid to final rest in Summit View Cemetery in Guthrie, Oklahoma. To make sure the corpse would not make its way back to the entertainment world, the state medical examiner ordered two cubic yards of cement poured over the coffin before the grave was closed. McCurdy hasn't been seen hanging around amusement parks since. I originally heard this story on a Urban Legends on A&E. With something like this being within driving distance I had to check it out. The "Pike" has been closed down for years, but I found out plans are on there way to rebuild the "Pike". What will this cause? Will the ghost of Elmer McCurdy be seen about the new Amusement center? Will a recreation of the body of Elmer McCurdy be within the new fun house or is this something they want to keep from the general public. Time will tell and yours truly will be there on opening day to find out more and what kind of legends will float around the new park.